You may have heard this week, that iTunes was going DRM-free. Of course, it didn't happen. Apple's iTunes, under Steve Jobs, is still stubbornly the only major distributor of DRM-encumbered music at a time when Amazon, Rhapsody, Napster, eMusic, Magnatune, 7 Digital and more are all selling music without restriction. This holiday season, we're asking you, the consumers and DRM-activists, to make the desire for the end of all DRM on iTunes a reality. 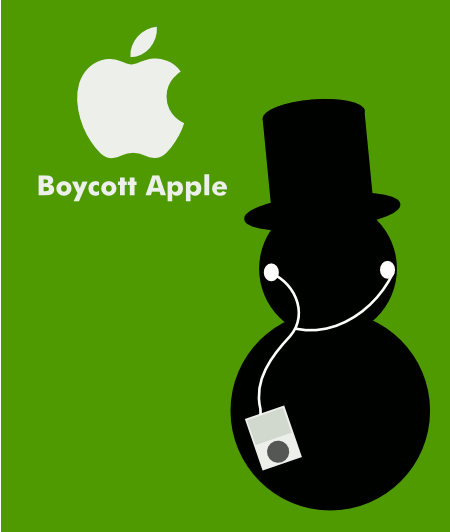 By including iTunes gift cards and purchases in your boycott of all Apple products, you can help drive change.